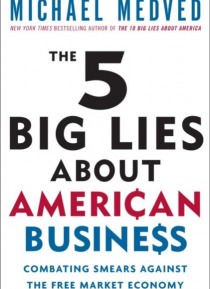 WHY FEEL EMBARRASSED BY BUSINESS?Every American benefits every day from the phenomenal productivity of the free market, so why do so many people feel guilty or skeptical about our business system? In this passionately argued, eye-opening book, talk-radio star and bestselling author Michael Medved provides detailed and devastating rebuttals to the most widely circulated smears against capitalism.MY… TH: Big business is bad, small business is good.TRUTH: Every big business began life as a small business, and every small business today yearns for enough success to become a big business tomorrow. For some productslike cars or electrical powerlittle companies can't benefit their workers or customers as reliably as huge corporations.MYTH: Business executives are overpaid and corrupt.TRUTH: Top leaders will always command top dollar, and a company can't limit executive pay without limiting its access to talent. Ferocious, long-term competition in the corporate world ultimately rewards focus and hard work, not short cuts and corruption.MYTH: You can count on better treatment from the government than from business.TRUTH: If a private company deals with you poorly, you can take your business elsewhere. But with the government's power, you get only two choices: compliance or jail. Medved responds to business-bashing lies with the slashing wit, irrefutable facts, fascinating historical nuggets, illuminating anecdotes, and liberating clarity that made him one of the top-ten talk-radio hosts in the United States. This audaciousand urgently needed book provides energy and inspiration for a beleaguered free-market system poised for its unstoppable comeback.From the Hardcover edition.